We found Gladys's Café the first time we visited St Thomas, while Beta Wife and I were doing some downtown, touristy shopping stuff. 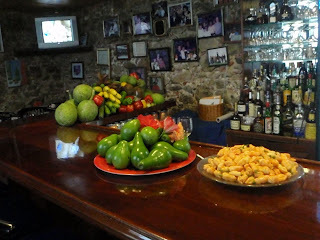 The sign outside promised Bloody Marys, so we wandered in and had a seat at the bar. As for the beverage I ordered, I cannot say much. I don’t recall seeing any vodka poured in the glass; in fact, I’m fairly certain we just had a tall glass of tomato juice on the rocks. No horseradish, no pepper, just blaaaaand, tomato juice. 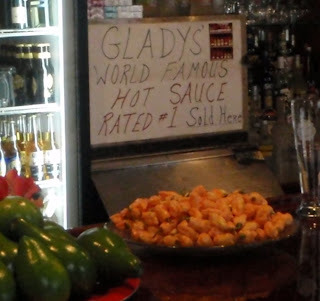 But, it gave us a chance to try the hot sauce that they make in-house and that they’re apparently famous for. Unhappy with my not-very-exciting Bloody Mary, I freely poured some of the red sauce into my glass and took a drink, and for a few seconds afterwards I was sure my mouth was actually, physically on fire. Gladys means business. Don’t be fooled by her flitting about, singing along to Tina Turner—her hot sauce is dangerous. That’s why on this visit I made sure to stock up on a few more bottles. You can’t order it online; it’s only available in her restaurant. I’ve found that the yellow hot sauce (the two main varieties are yellow and red) is particularly tasty in potato/pasta salad, the red sauce is good in chili, and either one makes a really good spicy sandwich spread. You don't need to add much--less is more. I should also mention that they make a pretty good breakfast there, too. Stop in for some French toast and pick up some hot sauce on the way out.